Formulate® Oval counter couples lightweight hardware with a printed stretch silicone edge fabric graphic (SEG) to create a funky and functional reception stand with an oval shaped tabletop. The graphic is enclosed on all sides from top to bottom, creating a private storage space. 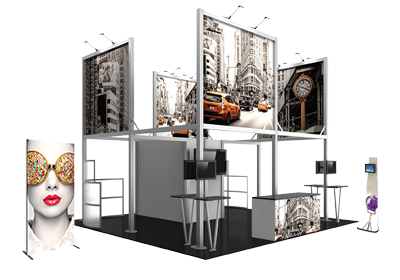 Easily add a reception space, extra display capability or storage to any trade show exhibit or event and retail environment. Tabletop and base are available in choice of four finishes.